These photos were taken a number of months ago but I never got around to posting them. I wasn’t sure how I felt about them too; I totally don’t know what’s up with some of my poses. But at least it gives me the chance to show my purple Guess jeans which I’ve wanted to do for a while now. I admired these jeans in Guess earlier in the year. I loved the colour and the sparkly Guess logo on the back. I absolutely never thought that I would actually own them. I was so surprised and happy when my mother in law bought them for me. I can remember that night distinctly because I’d had a very stressful day and it was just what I needed and it made me feel so much better. It’s my first ever pair of Guess jeans too! As for the cardigan I bought it on sale from Alannah Hill. I don’t know why but I had a random desire to wear it with these jeans. It’s not a colour combination I’d usually think of but now I like it. I love all the hearts that cover this top. Today my black heels, that I’m wearing in this post, broke. What a sad day for my wardrobe! 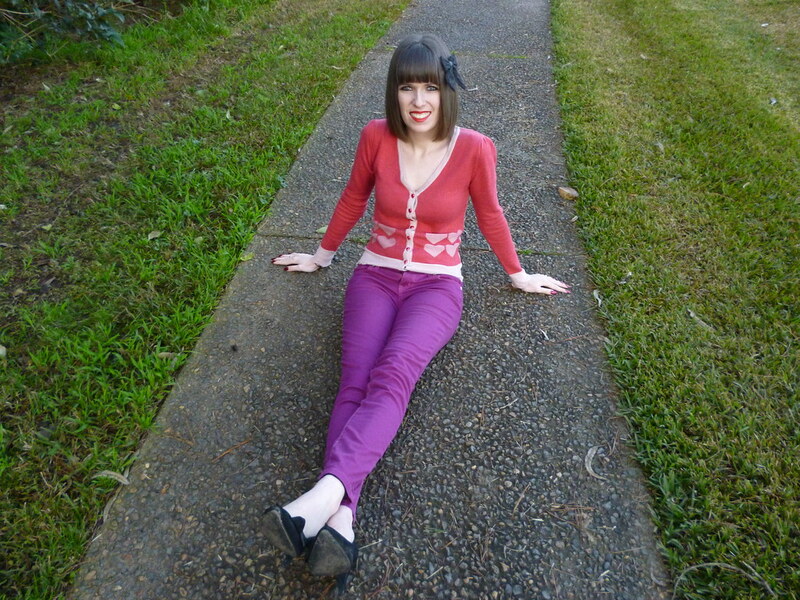 This entry was posted in Alannah Hill, Guess, Outfits. Bookmark the permalink. The colour and fit of your purple Guess jeans is beautiful. That was sweet of your mother in law to buy them for you. Your poses are nice and provide a good look at your outfit from a variety of angles (including the sparkly Guess logo). 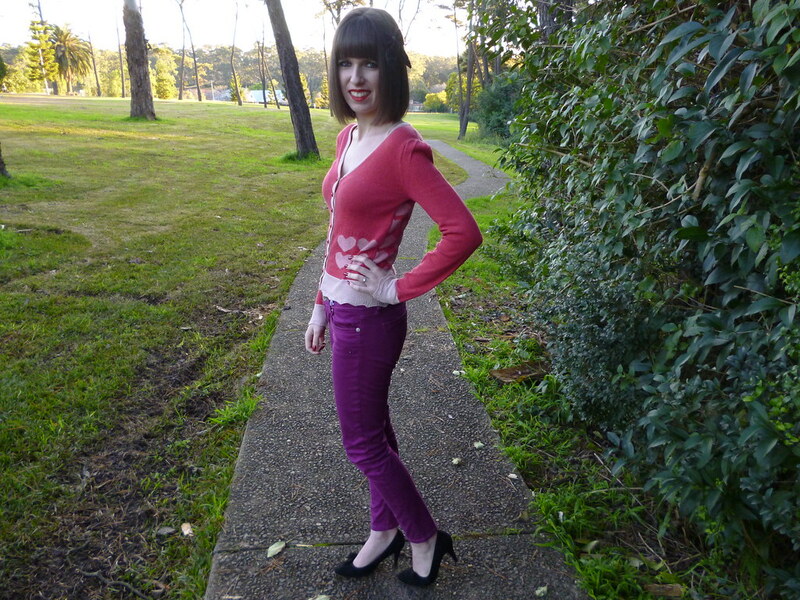 I love the hearts and the scalloped bottom edge of your Alannah Hill cardigan. It's a lovely outfit in two very pretty and feminine colours. There is absolutely nothing wrong with your poses! And I love youtr jeans thay look great on you!! I think I need some purple jeans! this outfit says: “it's all about the detail” 😀 i love the heart detail on your cardigan ! Colour suits you so well! I love the coloured jeans. just L♥VE your cardigan! so cute! you are ROCKING those jeans! You always look so adorable! I love the colors in this outfit. You really know what works for you — such a good eye for styling. OMG I think I'm in love with your heart sweater! It's so cute! And your hair bow makes the look extra sweet! I would love for you to visit my blog sometime and I also have a giveaway going on right now-open internationally! you go girl for pulling off this bright colored outfit! Oh my goodness love the heart print cardigan and the bright pants. Sorry for your heels, the looked so pretty! I really love the jeans! Fabulous color and fit! I am so jealous that you got them as a present! Awesome cardigan that you paired with them! A really nice color mix! I love the color of your outfit. That sweater is positively DARLING!